Last year Michael had a business trip that took him to Naples, Italy for the very first time. Needless to say he was very excited about the trip and sought all sorts of advice on local foods to try, and everyone familiar with the area told him he could not leave Naples without trying the limoncello. He came home from his trip enthused about all the different foods he enjoyed and he was stoked about the limoncello and arancello, but his favorite was the arancello. Listening to him describe the food made me feel a little bit envious, but hopefully someday I’ll have an opportunity to visit the famous city and other parts of Campania. 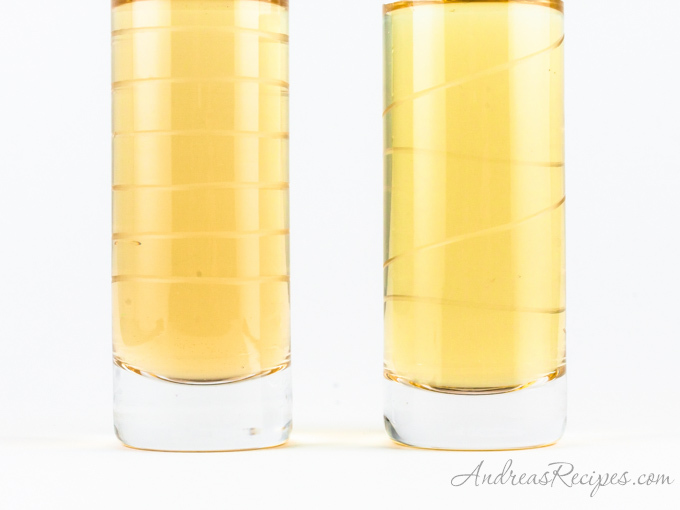 Arancello/limoncello is a traditional liqueur from Southern Italy, and it’s easy and inexpensive to make, requiring only citrus fruit, vodka or a neutral grain spirit such as Everclear or Gem Clear, sugar, and water. You shave the peel off the oranges and soak them in the alcohol for seven days, strain, then mix with the sugar syrup. The liqueur is usually stored in the freezer but the alcohol content prevents it from freezing solid, so it’s drinkable. The higher alcohol content in neutral grain spirits draws out more of the orange oils than vodka, imparting more flavor to the liqueur; however, neutral grain spirits are not sold in some states and might even be illegal in your state, so check your state’s liquor laws before having a friend run it across the state line for you. 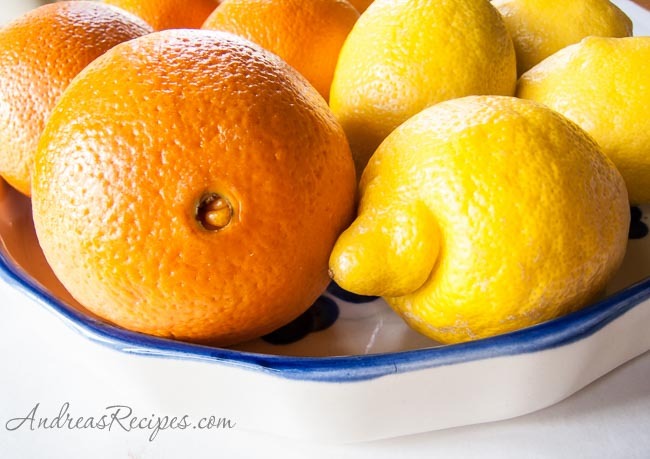 With citrus in season, this is a great time of year to make arancello or limoncello. We keep several bottles on hand in the freezer, and though we enjoy it straight out of a shot glass, our favorite way to sip is with a little half & half poured in, which makes it taste like a very adult Creamsicle. We also tried it with eggnog at Christmas and really enjoyed that combination, and we even made a champagne cocktail with limoncello for New Years Eve. Adapted from What's Cooking in America. SOAK THE ORANGE PEELS: Scrub the oranges with a vegetable brush to remove any dirt and other undesirable elements (i.e. pesticides if you chose not to use organic). Carefully peel the oranges, making sure not to include any of the white pith. (It will make your cello bitter.) Juice the oranges and save for breakfast. Put the peels in the bottom of the container(s). Pour in the alcohol and cover. Allow to rest for seven days in a cool, dark location. I keep mine in the cupboard. SYRUP: Make this in the morning of the eighth day or the night before. In the 6 quart pot, combine the sugar and water. Bring to a fast simmer, not boil, and let it sit for 15 minutes, until all the sugar is dissolved. Remove from heat and cool to room temperature. On the eighth day, strain the orange peels from the alcohol and discard. Pour the alcohol into the pot with the sugar syrup and stir. (If you use Everclear, the mixture will turn cloudy, but this will not negatively affect the flavor.) Pour into the prepared wine bottles, cork, and store in the freezer. 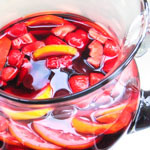 Use the freshest fruit, which will have more oils in the skin, thus increasing the flavor. Use a vegetable peeler to remove the skin, and peel carefully so that none of the bitter white pith is on the pieces. Im from Italy, and we cook great food, and we do great drinks. What do I add if I want a little spice in the Arancello? Hi Bob. I will preface this by saying I’ve never spiced our arancello, but I have made other spiced liqueurs, so this is what I would do. If you want to use whole spices, I would add to the syrup mixture when preparing it. After it cools, strain out the solids well by pouring through a coffee filter, and finally mix with the alcohol. Let me know how it turns out! I’ve always wanted to make limoncello. I can’t wait to try! I haven’t made arancello yet, though I know I’d love it. I did make some limoncello recently with my dad, and it takes all my willpower not to drink every night! It’s like frozen lemonade for adults, isn’t it? Thanks for the great post, Andrea. I really enjoyed it. Enticing photos! I have a soft spot for limoncello—the first time I invited my parents to see my apartment (my first after college) in Boston’s North End, we toasted with my very first shot of limoncello. Many memorable firsts for a day 🙂 Arancello sounds amazing too! I haven’t tasted or really seen much arancello here in Italy but I’m sure it would be great to mix it with some sparkling wine and have a new version of a mimosa, too! Yum! I read an article in Sunset magazine back in 2007 about making Limoncello, and ever since, I have been hooked. 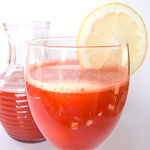 It is so easy to make, and you are right, now is the season with citrus so plentiful. For limoncello, I prefer to use Meyer Lemons, I think the flavor is much nicer. And I use a mix of Everclear and 100 proof Vodka. Makes wonderful gifts! Mmm…I’m going to have to try this sooon. Sounds so delicious and I LOVE limoncello. I’ve tried this a number of times but it never has the magic for me that limoncello does. It always ends up tasting too much like orange zest (which stands to reason) and not enough like oranges. 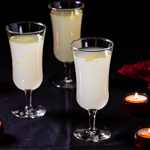 I have just made Limoncello – waiting to drink now…… have made it a few times now – always successful. You can find this recipe on uktvfood.co.uk. It is a James Martin recipe and it is really good, mind you, all of his recipes seem to work – great chef! About how many oranges did you use? Most other recipes I have seen use much less water and sugar. Is your version weaker or does it still have a strong flavor? Peeling may be quicker but zesring is far better. It’s easier to control depth and makes a lot more surface area. Also, simple syrup should be added along with the original soak for about half as long before straining / filtering. ONLY EVER ORGANICS. ONLY EVERCLEAR. Also, try adding vanilla beans to your aranciello.